How much would replacing streetcars with buses cost? On January 12, CodeRedTO’s Executive Director Cameron MacLeod was a guest on Edward Keenan’s radio show on NewsTalk1010, discussing the hypothetical idea of replacing streetcars on King and Queen streets with new articulated buses. The theory behind this oft-floated but never-costed idea is to help traffic move, but the positioning is invariably that of a driver ‘stuck behind a streetcar’. Little attention is paid to the many residents on that streetcar who also wish to travel somewhere and have just as much right to do so. It’s key that improvements help people travel more efficiently, not that cars necessarily travel more efficiently, as the average car in Toronto carries just 1.1 people, according to a previous Chair of the TTC. This means that old rusty streetcar could be carrying nearly 120 cars worth of traffic! Capacity is the big issue with this idea: King and Queen combined carry over 100,000 riders per day – more than double the Sheppard subway, and more than the entire GO Transit bus network combined. Any change needs to take into account how those thousands of riders will get where they’re going. We calculated that to replace the King and Queen streetcars would require a purchase of up to 185 articulated buses just to maintain the capacity the TTC has scheduled, not provide any increase. That would mean a capital cost of $174M to purchase the articulated buses, and additional driver salaries of up to $8.2M per year – a significant outlay for a transit system that for several years has ‘robbed Peter to pay Paul’ in its operating budget, and and is facing a multi-billion-dollar shortage of capital funding in just the next 10 years. Other costs would be required as well: fuel for these vehicles versus electricity costs for the streetcars, a new garage to store these vehicles, new maintenance and cleaning staff to keep the buses running, and more. Never mind the cost to cancel or redirect the current $1.2B contract for 204 new accessible low-floor streetcars, which the TTC is hoping to expand by 60 more to help upgrade capacity across the network. Even should the costs concerns be waved away, buses would encounter many of the same challenges as streetcars in the crowded and busy King and Queen corridors: blocked lanes due to left turns, parking, taxis, and delivery trucks; bunching due to route management issues or disruptions; blocking other traffic by leaving their “tail” sticking into the left lane as they weave around parked cars, etc. These issues can and should be addressed regardless of the type of vehicle being used on a specific street. There’s a legitimate conversation to have about transit modes, technologies, and where each one fits best. 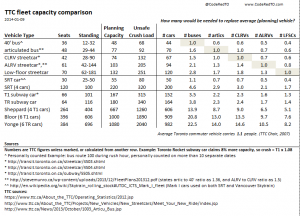 But simply swapping out one type for another lower-capacity option is very expensive, and does not address the underlying issues. 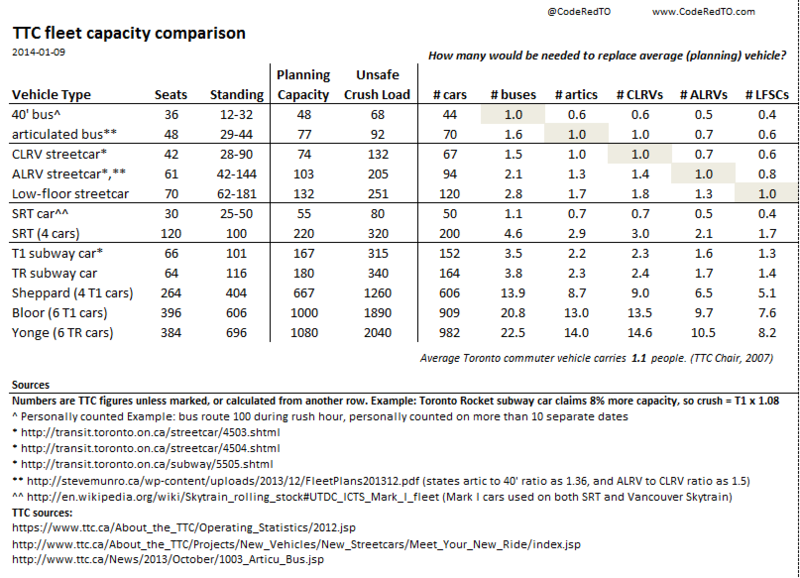 CodeRedTO recently gathered data to compare the capacity of each type of vehicle in the TTC fleet, including the new low-floow streetcars entering service this summer. Click below, or click here for the Excel spreadsheet if you’d like a copy.